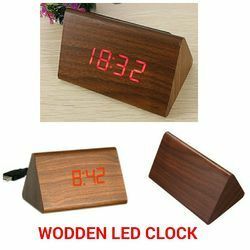 Our range of products include wooden led clock, cube shaped wooden led clock, lifetime calendar with clock and month display, water bottle water powered water clock, desk pen holder clock and 3 in 1 desktop ecoset. • Premium USB clock made of actual wood! 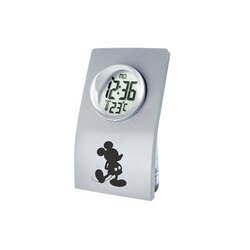 This is promotion desktop item Steel Life time Calendar with Month Display and Watch. There is plate to set every month. We have successfully achieved a reputation position in this industry by maintaining the quality of our entire product range. Our Water Clock is one of the most preferred choices of clients because of their high designing. They are precisely designed and accurate in dimensions. Demand for our entire products range is high in the market because of their nominal prices. They are processed and packed under the firm direction of quality controllers. 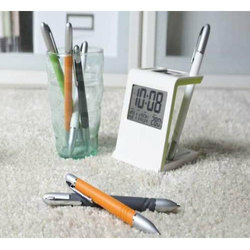 Desk Pen Holder Clock comes with a digital clock. You can also keep your stationary in it. It can be customised with logo printing. Eco friendly 3 in 1 desk item. The silicon panel absorbs light efficiently into the built-in battery. 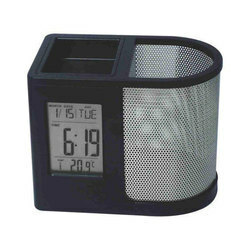 This multi functional item can be used as alarm clock, pen holder and card holder . 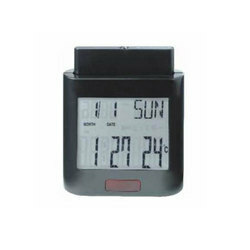 It is re attachable desktop clock when opened it can also be used as a card holder. 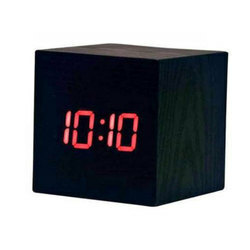 Cube Impression Clock, not only creates a stylish impression but also gives the impression of wood. A bright red LED screen that displays the time and temperature. Not only creates a stylish impression but also gives the impression of wood. A bright red LED screen that displays the time and temperature. 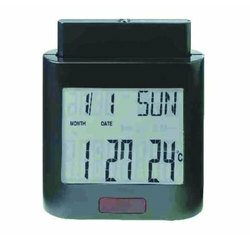 Digilator Digital Clock has compact and stylish desktop device displays the time, date and day on a digital screen. Comes with a detachable calculator. 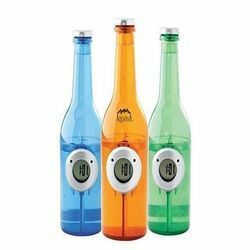 This Water Clock is environmentally friendly and requires no batteries, chemical or electricity to function. Simply pour few drop of water to make it work. 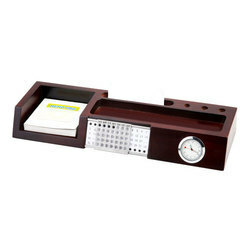 Wooden Desktop Calendar with Clock is made up of Wooden Material. It comes with Clock, Wooden Calendar. It can be customized with Logo Printing. Multi purpose Desktop calendar. 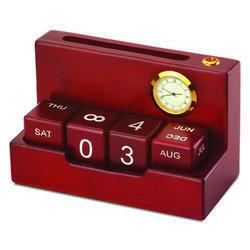 Perpetual calendar with Clock. Car Holder, Pen Holder and Memo pad Holder. 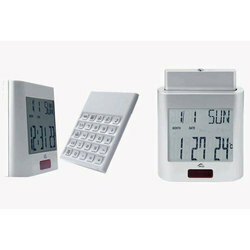 Justifying our reputation in this highly competitive industry, we have brought a wide assortment of Digital Clock. These are manufactured using optimum-quality material in conformity with pre-set quality values. These can be also reformed by adroit professionals in various provisions. 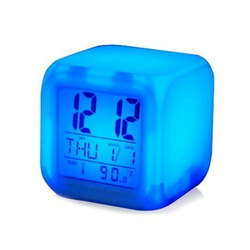 Dice Colour Changing Clock with 12H/24H LCD Time Display with Day/Month/Year 7 colour Changing Light Display. 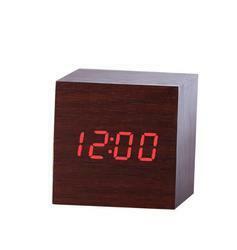 Driven with excellence, we are readily affianced in presenting Digital Tabletop Clock to our customers. These are made under the guidance of skillful personnel by using finest grade material in conformism with the pre-set quality norms. In addition, quality auditors methodically review these on predetermined norms. 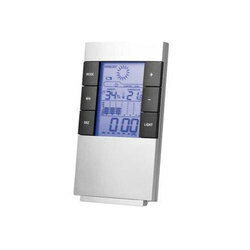 This Sleek desktop device displays the day, date and time on its LCD screen as well as forecasts the weather, humidity levels and temperature for the day. 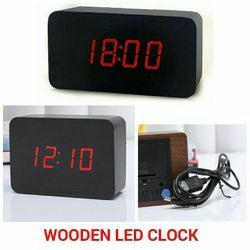 We offer the subjective scope of Desktop Clock to our regarded customers. Our offered endowments are exceedingly requested among our customers for their fine complete and alluring outlines. These endowments are wonderfully outlined and made utilizing quality tried essential material and most recent innovation. Besides, to guarantee the best quality, quality controllers inspect these Clock against a few quality parameters. We offer these check to our customers in a given timeline at business driving costs.